Kaitlynn Marie: 31 Days of No Spending Challenge | Day 31 - Last day! 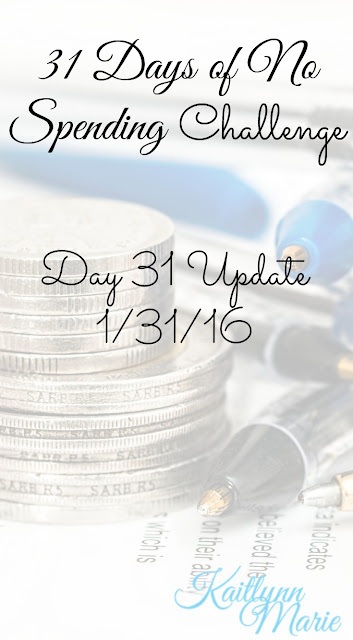 31 Days of No Spending Challenge | Day 31 - Last day! Gah! Today is the last day of my challenge! I can't believe it's the 31st already! Check out my original post here, my day 11 update here, and my day 21 update here. It has been such a weird month for me. The year 2015 was full of firsts and some weird experiences. It was definitely a difficult year. Starting 2016 with a "No Spend Challenge" was supposed to get me off to a good start for the year. I can't say it has succeeded. It hasn't entirely failed, but it wasn't a grand success. But a lot of things changed, and things came up that were unexpected. So, we'll start by listing expenses for the last ten days. On the 21st, after my last update went live, my PicMonkey subscription came out. I had actually forgotten all about that. Not good, but it's only $4.99. Over the last ten days, between two transactions, I've spent $74.48 at WalMart. To be honest a lot of that was stuff we needed for the house, like laundry soap and toilet paper. I did buy a shirt for work, which was a $10 splurge, and I had to buy some yogurt for breakfast for the week. Best Rents (which is like Rent-A-Center) took my autopay late last week, so it processed on 1/24. Then this week they actually took less than they have been. I'll be calling just to make sure this is accurate, but for now they've taken $91.05 for the two weeks (should have been $120). Like I've mentioned in the past, I pay my rent/gas to my sister (Amanda) by paying her car payment because it equals the same amount. Since my last update I've paid it twice totaling $130.16. My phone came out as an autopay, which I had actually turned off but oh well. That total was $43.73. I borrowed my other sister Brenda's car last week and this week so I owed her $20 in gas, plus I got myself a water for $1.59. I also got myself food for $6.77 and spent another $8.75 at the vending machine. Buuuut, when I went into this I was only counting the money I would be making from the spa, now that I have a second job, I have that money too. I actually didn't get the check due to an error in the mailing address, but that just means that I can't spend it until after this challenge ends anyway! I feel like even though I had a lot of bumps and I spent money I shouldn't have, I still succeeded in saving money. I'm going to post an overall update in the next couple days but I wanted to outline the last ten days for you. Thank you to everyone that has been following along with me. Have you been completing your own no spend challenge? Or has this made you want to do a challenge of your own? Let me know in the comments below!